In 1905, Albert Einstein, a 26-year-old patent clerk, wrote a paper that revolutionized science. In his Special Theory of Relativity, Einstein explained that the speed of light was constant but that both space and time were relative to the position of the observer. 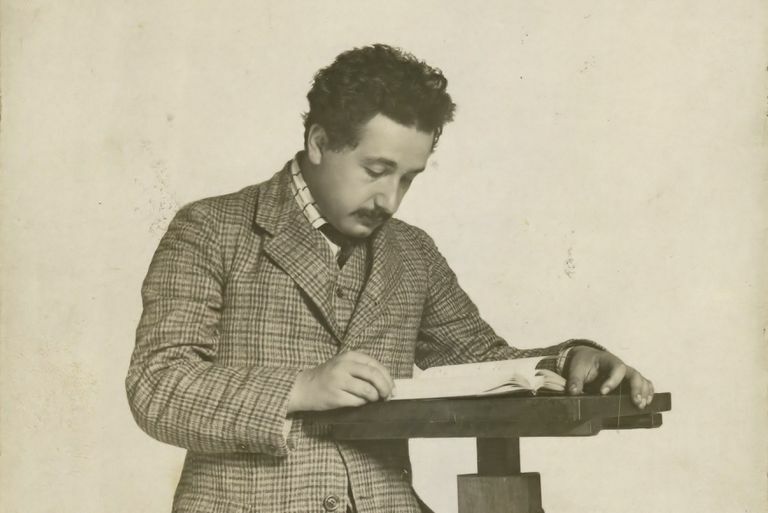 In 1905, Albert Einstein was not a famous scientist -- actually, he was quite the opposite. Einstein had been an unpopular student at the Polytechnic Institute, at least with the professors, because he wasn't shy about telling them he found their classes dull. That was why when Einstein (barely) graduated in 1900, none of his professors would write him a recommendation letter. For two years, Einstein was an outcast of sorts and was very lucky to finally get a job in 1902 at the Swiss Patent Office in Bern. Although he worked six days a week, the new job allowed Einstein to get married and start his family. He also spent his limited free time working on his doctorate. Despite his future fame, Einstein seemed an undistinguished, 26-year-old, paper pusher in 1905. What most did not realize was that in between work and his family life (he had a young son), Einstein worked diligently on his scientific theories. These theories would soon change how we viewed our world. In 1905, Einstein wrote five articles and had them published in the prestigious Annalen der Physik (Annals of Physics). In one of these papers, “Zur Elektrodynamik bewegter Koerper” (“On the Electrodynamics of Moving Bodies”), Einstein detailed his Special Theory of Relativity. There were two main parts of his theory. First, Einstein discovered that the speed of light is constant. Secondly, Einstein determined that space and time are not absolutes; rather, they are relative to the position of the observer. For example, if a young boy were to roll a ball across the floor of a moving train, how fast was the ball moving? To the boy, it might look like the ball was moving at 1 mile per hour. However, to someone watching the train go by, the ball would appear to be moving the one mile per hour plus the speed of the train (40 miles per hour). To someone watching the event from space, the ball would be moving the one mile per hour the boy had noticed, plus the 40 miles an hour of the speed of the train, plus the speed of the Earth. In a follow-up paper also published in 1905, “Ist die Traegheit eines Koerpers von seinem Energieinhalt abhaengig?” (“Does the Inertia of a Body Depend Upon Its Energy Content?”), Einstein determined the relationship between mass and energy. Not only are they not independent entities, which had been a long-held belief, their relationship could be explained with the formula E=mc2 (E=energy, m=mass, c=speed of light). Einstein's theories not only changed Newton's three laws and transformed physics, it became a foundation for astrophysics and the atomic bomb.